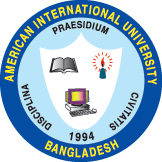 The Vice Chancellor of the American International University-Bangladesh, Dr. Carmen Z. Lamagna, was selected as top 100 women of the world under the education category by the International Alliance for Women (TIAW). The announcement was made by Mr. Stephanie Mackendrick, Chairman, TIAW World of Difference Awards and Ms. Sherry Fotheringham-Gysler, President, TIAW based on Ontario, Canada. The selection was made out from the many women who have exemplified themselves in a specific field. The humble story of Dr. Lamagna being the first woman Vice Chancellor in Bangladesh has inspired women to take actions in support of women’s empowerment and advancement in society. Her extraordinary accomplishments in promoting women through education-based programs, initiatives or personal action in a developing country like Bangladesh have earned for her the most coveted recognition. The awarding ceremonies will be held in the Canadian Embassy in Washington, DC as part of the TIAW Global Forum on 18 October 2012. Dr. Carmen Z. Lamagna is the first awardee from Bangladesh of this worldwide prestigious award. CONGRATULATIONS ,THE AIUB COMMUNITY IS EXTREMELY HAPPY AND PROUD OF YOU !